Whether you are completing the NC500 route, touring the Northern Highlands or just want to stay locally there is so much to see and do . Take a look at our suggested daily car tours from the B&B, our A-Z guide of things to do, local places to eat and for family run local activities within 10 minutes of the cottage. There are some great ideas included in the next section and the HOST video below. In addition to all the outdoor activities mentioned here we are lucky to have a wealth of good quality restaurants and other places to eat in the local area. There are several opportunities to indulge, with some very interesting and high quality eateries nearby! www.gowildhighlands.co.uk Based in Lairg they are a small, family run company running open canoe trips down the Kyle of Sutherland and other Sutherland locations. 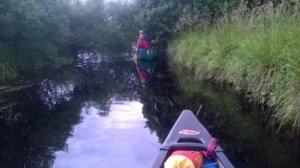 This slow moving, easy river is ideal for the beginner or anyone looking for a slow adventure rich in wildlife, scenery and history. All ages and abilities catered for. 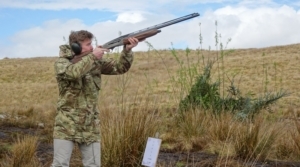 www.highlandshootingcentre.com A family run concern offering shooting based activities from clays, underground rifle range and air pistols. Full training and all equipment provided. Cassley Falls: Stunning waterfalls just a 10 minute walk from the cottage. Enjoy the stunning waterfall and look out for the resident otter. At certain times of the year watch salmon leaping the falls to return to their spawning grounds. Invercassley Cottage is in the perfect location for touring all of the Northern Highlands , being 40 minutes from East and West coast and just over an hour from the far north. So why travel around changing B & B’s and constantly unpacking, when you can enjoy leisurely daily car tours enjoying everything the area has to offer and then return to your comfortable room for the evening. Of course our cottage may only be a rest point on your journey, we make a great night stop on the way to John O Groats to catch the ferry to the Orkneys, even if only for a day trip. Travelling from Stornaway after a spell of island hopping ? Then we are only 40 minutes from the ferry port of Ullapool and gives you a chance to rest before your journeys south towards Glasgow , Edinburgh and Aberdeen airports. Travel through Bonar Bridge to Spinningdale; maybe stopping for a walk around Loch Migdale to watch the Red and Black Throated divers often found there or see Osprey fishing in the loch. 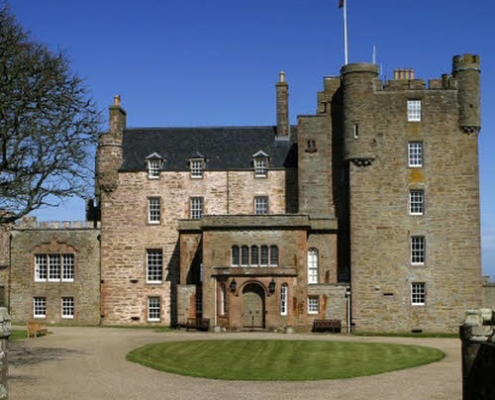 Stop off at Dornoch to visit the Cathedral , have some retail therapy at the range of shops to be found there , stop for lunch at Luigi’s or The Courthouse or take a walk along the beautiful beach. The A9 lets you visit the nature reserve of both Loch Fleet and The Mound to look for seals, fishing ospreys and a huge variety of wading birds. Go rock pooling at Embo beach or stroll along Littleferry beach before the drive home through Strath Fleet , maybe popping into the Pier cafe in Lairg for a coffee and a cake on the way home. 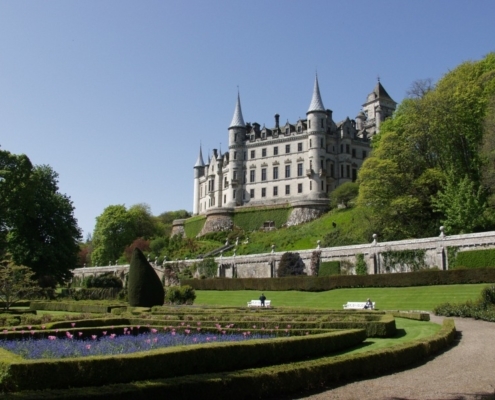 Take the A9 east and visit the enchanting Dunrobin Castle with its coastal location and stunning gardens. Visit the town of Golspie and walk the Big Burn walk , or take a tour of the Clyneish distllery. Carry on up the coast towards Brora and Helmsdale and take time to visit the Timespan Heritage centre. 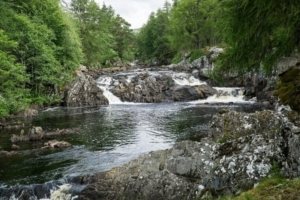 Drive home along Strath Kildonan and pay a visit to the historic Rosal clearance village before heading back towards Lairg and maybe stop off at remote Crask Inn for a quick drink. Heading west gives you a wealth of touring options that could provide you with day trips for every day of your holiday. Head towards the west through stunning mountain scenery to the coastal port of Ullapool, walk around the harbour and maybe enjoy lunch by the water. Alternatively head towards the Summer Isles and enjoy the views over the islands or take a boat cruise to get a closer look. Turn towards Inchnadamph and take a walk to the historic bone caves. 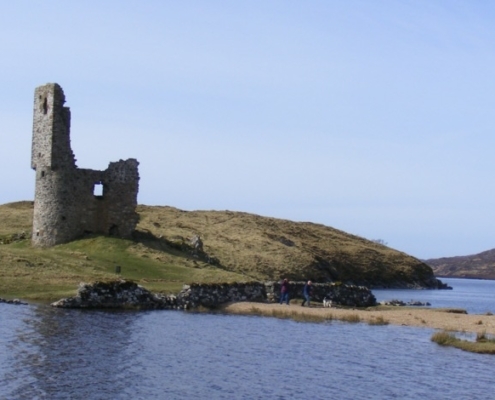 Drive along Loch Assynt and admire the beautiful Ardveck castle ruin before taking a detour to admire the Caribbean style beach of Achmelvich. Drive into the harbour port of Lochinver to take lunch at the famous Pie Shop, Peets restaurant or maybe splash out at Chez Roux. Enjoy a morning or afternoon boat trip from the harbour around the islands to wildlife watch or maybe a fishing trip.Take the longer drive towards the Point of Stoer where you can walk out to the point or sit by the lighthouse and watch whales and dolphins from the clifftop, enjoy pancakes from the Living the Dream stall and pay a visit to the most northerly compost loo in Britain. Carry on towards the village of Scourie and take the boat trip to the bird reserve of Handa Island to watch thousands of seabirds such as guillemots, razorbills , skuas and puffins. We recommend stopping at the Shorehouse restaurant as you get off the boat for a welcome drink or to enjoy one of their fresh seafood dishes. Passing over the Struie Pass with its stunning views, will lead you towards the capital of the highlands Inverness with its retails therapy of big shopping centres, cinemas, theatre and restaurants. Take a step back in time and visit the historic town of Cromarty with its pretty whitewash cottages or visit the home of geologist and writer Hugh Miller. 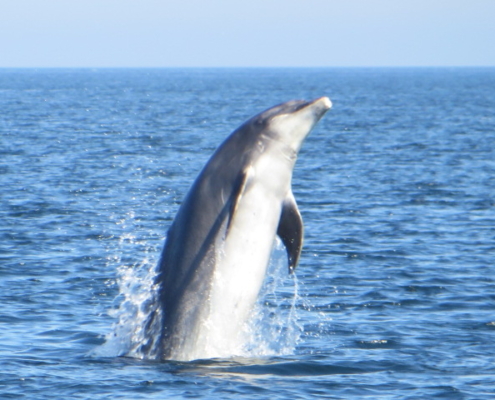 The fertile land of the Black Isle gives the chance to see Red Squirrels , visit bird hides overlooking estaurys or travel to Chanory Point for Britains best sites to view bottlenose dolphins at close quarters. 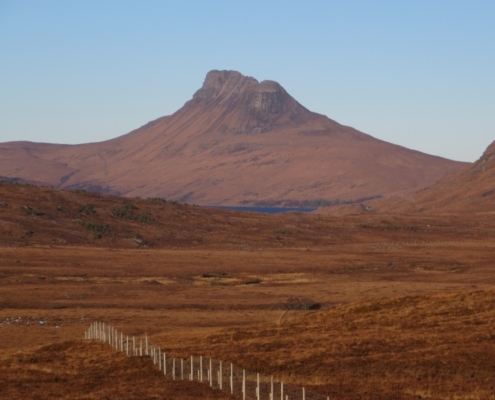 Ben More Assynt , admire the scenery and the wildlife found there including; Red and Sika deer, Ospreys and Golden & White Tailed eagles. Don’t forget to stop off at the spectacular Cassley falls, where at certain times of the year you can watch the salmon leaping on their way to their breeding grounds. As one of our guests put it extremely well .. Although we do not provide evening meals , we are lucky to have a wide choice of cafes and restaurants in the surrounding area that provide both lunches and evening meals. We are happy to give you some of our personal recommendations below, and can contact restaurants to book tables during your stay if you would like us to. Please click on the name of the restaurant to be linked directly to their websites. If visiting in winter months please check opening times as many Highland restaurants are closed or have restricted hours. Situated in the village of Rosehall, and only a short walk from the cottage. The public bar offers a wide menu of bar meals and daily specials for both lunch and dinner. The hotel restaurant offers a carvery type three course meal during the fishing season to non residents, but must be pre-booked. Open daily from 12-2pm for lunch and from 6pm for evening meals , last orders at 8.30pm. Small 24 seat award winning bistro located in Bonar Bridge , 12 miles away from the cottage. 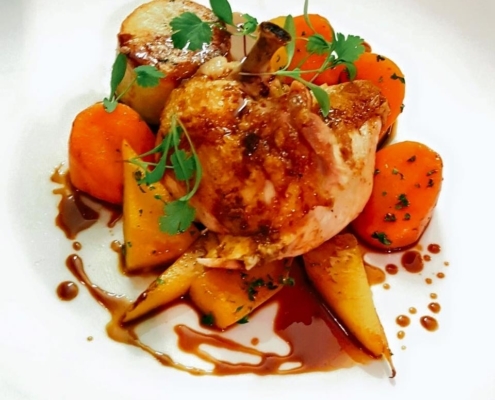 Run by a couple, Ian and Jenny Smith, they offer a menu of well prepared tasty unprententious food using only local ingredients. Restaurant is open evenings only from 6pm Tuesday to Saturdays, with last orders at 8.30pm. Also offer food themed nights during the year. Advisable to book. Lochside cafe/ restaurant in Lairg, 8 miles from the cottage. A wide ranging menu of fresh food using local produce for both lunch and evening meals (Friday & Saturday only). Food available all day. Outdoor seating by the loch also available. Opening times : Tuesday- Thursday 10am-4pm, Friday & Saturday 10am-4pm and then 5.30pm-9pm , Sunday 10am-6pm Closed Mondays. Advisable to both at busy times and especially for evening meals. Luigi is a contemporary and friendly cafe/restaurant located in the coastal town of Dornoch, 26 miles from the cottage. Open daily for lunch and hot drinks and cake. Evenings are a little more formal with a relaxed casual atmosphere, and offer a varying continental style menu with an emphasis on local seafood. Opening times: Open daily at 10am . Dinner served between 6.45 – 9pm during main summer months, and weekends and additional evenings during Spring and Autumn. Advisable to book as does get busy. Award winning pie shop in Lochinver (40 minutes from the cottage) which offers a large choice of pies, both sweet and savoury, made on the premises. In addition they have a wide ranging bistro type lunch menu. Can order the pies as a takeaway and even have them delivered to your home address as a reminder of your holiday. Food is served in the conservatory or the restaurant which overlooks the river and estuary. Open from 10am-5pm and then from 6pm for evening meals. The hotel is a ten minute drive from the cottage. The main hotel has a restaurant which offers a carvery style buffet meal in the evening, tables must be booked in advance as priority is given to fishermen staying at the hotel. Attached to the hotel is a small public bar which offers a menu of both snack type pub meals and main meals for both lunch and evening meals. Hotel is only open during the main salmon fishing season. Award winning hotel located overlooking the Loch Glenhu , 45 minutes away. This is a family run hotel, a former coaching inn that dates back to 1680. Serving fresh high quality local ingredients specializing in seafood and shellfish. Recently refurbished it is popular with locals and tourists alike. Tables also available outside to enjoy the view and watch local wildlife like seals and otters. Lunch is served from 12-2.30m and evening meals from 6-9pm. Based in a harbour side location in Lochinver, Peets offers a friendly welcome, fine locally produced food, in a relaxing atmosphere. Seafood dishes are a speciality with Lobster, Langoustine, Crab, Prawns and Squat Lobster are all landed at the harbour which is literally 50 metres from the restaurant. Open for lunches, afternoon tea and evening meals. Based at the Falls of Shin, Lairg. London based company now with a Highland restaurant in its owners home county. Offering a Scottish themed menu using locally sourced seasonal produce specialising in local venison. Open daily throughout the year and for evening meals on Fridays and Saturdays from 5pm-9.30pm. www.welcometoscotland.com – the complete holiday guide to Scotland. www.scotland-info.co.uk – the internet guide to Scotland, its accomodation, travel & general info. www.bestwalks.com – a comprehensive resource for all walkers. www.walkhighlands.co.uk/sutherland – the ultimate website for walking & hiking in Scotland, with free details walks and GPS waypoints. www.cycle-route.com – an extensive collection of tried and tested cycle routes across the UK. www.spanglefish.com/rosehallcommunityday/index.asp – the community page of Rosehall village, including a What’s On feature. www.northcoast500.com – A link to the Scottish version of Route 66 . The new scenic route showcasing the highlights of the Northern Highlands. www.jmt.org – organization protecting wild places for people and wildlife. www.mcsuk.org – charity for the protection of our seas, shores and wildlife. www.scottishsquirrels.org.uk – organization working to save Scotlands remaining Red Squirrels. www.scottishraptorstudygroup.org – group studying & protecting Scottish raptors.